By calling in Mollart Engineering’s tooling specialist, a move that led to the introduction of a Steiner Autofacer back-counterboring tool, Atherstone-based precision subcontractor Lunn Engineering has been able to introduce a fully automatic production cycle, significantly reducing production lead-time and operational routines when machining cast iron flywheel housings for off-road vehicles. Previously, due to access difficulties and the design restraints of certain features, a separate counterboring operation had to be set up in an adjacent machining bay that not only introduced logistical problems and additional work-handling, but also significantly extended lead-times. He follows on to explain that the effect of combining operations from three into two has been relatively marginal on overall cycle time, but importantly it has enabled a fully automatic production cycle involving A and B fixtures on the twin-pallet machine that has considerably reduced lead times, work handling, setting, operator attendance and inspection times. 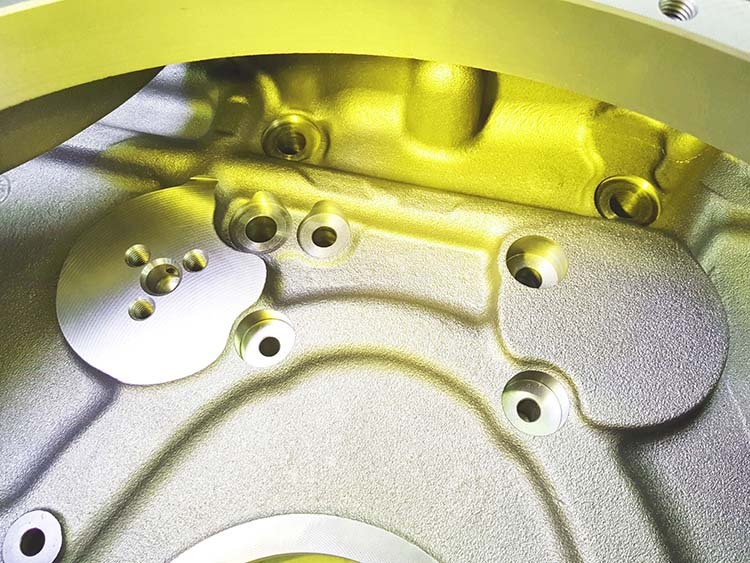 As a result of the change, Lunn Engineering has also been able to concentrate production and sub-assembly of the flywheel housing in one area of the works. Sharpe adds how the customer has gained from improved control over quality by eliminating a third relocation of the workpiece, while tool life has been increased to achieve some 120 counterbores per insert corner. 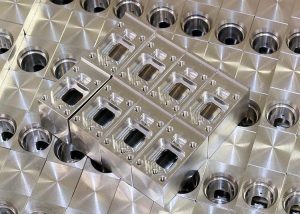 This improved performance is largely due to the combination of the inherent rigidity of the machining centre and the Autofacer tool set-up, as opposed to the previous method with varying tool life and the workholding arrangement of the borer. Lunn Engineering produces two types of housing for two- and four-wheel drive off-road vehicles at a rate of 15 per week. Following machining, the housings are cleaned, painted and then sub-assembled for the customer, which includes the insertion of bearings. The revised fully automatic machining sequence, following Mollart’s change to the application, now involves just two operations on the machining centre that incorporate considerable milling, boring, drilling, counterboring and tapping sequences. Following the approach by Sharpe, Mollart’s tooling specialist came on site to assess the operation. 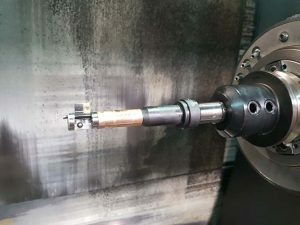 He found that with access to produce the three counterbores being severely restricted, the objective could only be achieved by back counterboring through three 18 mm diameter holes. These holes are drilled through from the outer face of the housing directly opposite the main flange face that is used for initial first operation location on the fixture. It was this main flange that partially covered each counterbore position. Adding to the problems was a steep draft angle around each of the three features which meant any back counterboring tool had to cope with progressive material build-up, creating a variable interrupted cut. Indeed, this draft angle aided the failure of previous attempts to back-counterbore using competitor tooling, resulting in chatter and inconsistent tool life. According to Sharpe, following the visit and assessment by Mollart’s tooling engineer, it was recommended that the Steiner Autofacer tool be employed because of its high rigidity and being well-proven in applications of this type. Both Sharpe and the engineer then worked together to develop the process and set the speeds and feed rates whereby the spindle is now run at 810 rpm at a feed rate of 0.04 mm/rev. The Steiner ‘bump style’ Autofacer spotface/counterbore tool is activated from contact with the datum face of the workpiece as it passes through the previously drilled 18 mm holes. Each drilled hole is used to support a pilot bearing on the Autofacer tool that is positioned behind the insert pocket on the body of the tool. By reversing the machine spindle, an internal friction clutch mechanically opens and locks the cutter blade to the set dimension of 36 mm diameter. The tool is then fed in reverse back into the casting, and when a programmed depth of 32.5 ±0.05 mm is reached from the machined datum face, is fed back before a cone positively drives the cutter blade to its closed position into the tool head. It now takes just 6 minutes and 20 seconds to complete the three holes. Lunn Engineering was originally formed as a general engineering and subcontract business in 1938 under the name of the Rotary Pump Company. In 1952, the firm changed to Lunn Engineering Co, when it became a principal supplier to the UK’s very active, at that time, machine tool sector. During 1960, the company moved to its current 16,000 sq ft site in Atherstone, producing five-speed gearboxes for the mining industry and safety clutches for conveyor systems. In 1969 the company obtained manufacturing rights for Lunn Davis keyseater machines, which the company updated two years ago to include its own design of control system. Since commencing production, Lunn Engineering has built over 200 machines with demand now increasing following the introduction of the new control. Lunn also specialises in design, development and prototyping for customers and employs 22 people. The company designs, builds and re-engineers equipment such as special rotary table chucks used in ultrasonic testing, and produces test rigs and fixtures for leak testing products such as domestic showers. 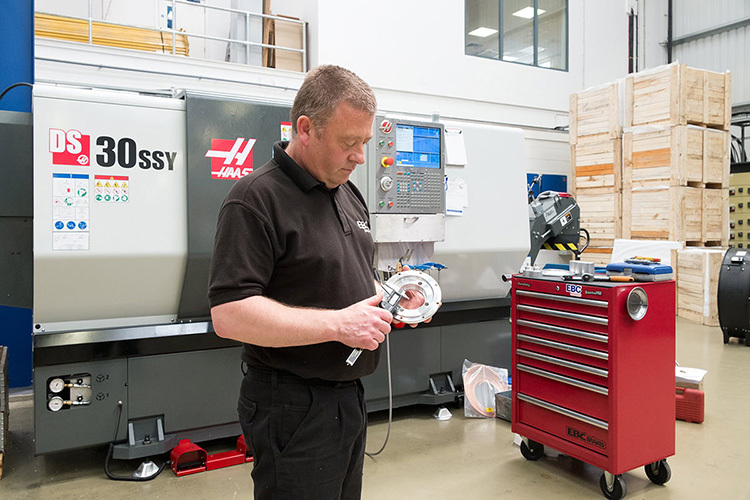 In addition to its design and build operations, Lunn’s subcontract production supplies sectors such as metrology, machine tool, off-road and specialist aerospace and automotive related industries with batches of work that vary between 40 and 300 parts. Over 70% of the order book is repeat business. Following the success of the application engineering and trials of the Mollart-supplied Autofacer, the engineering team is now working on further process improvements to replace twist drills used on specific deep holes in the two housing types with Botek gun-drills. This strategy will provide improved efficiently to produce certain special holes within ±0.2 mm geometrical tolerances. From its Bristol factory, Mil-Tu-Fit Engineering has been manufacturing precision components for the electronics, oil and gas, defence, construction and medical industries for over 40 years. The company’s machined products are generally under 125 mm diameter with low batch quantities from just one or two parts up to around 100. Commonly machined materials include 303 grade stainless steel and plastics. 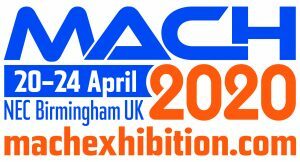 “Some of our existing machinery was reaching the end of its useful life and we needed to replace it, and at the same time upgrade our manufacturing capabilities,” says production manager Paul Beattie. Mil-Tu-Fit evaluated a range of options. The main criteria were a 4th axis, driven tools, the spindle diameter, the number of tool stations in the turret, accuracy and ease of programming. “Simplicity of programming on the machine was a major consideration as, with small quantities, we need to be able to complete this task quickly and be sure it is right first time,” says Beattie. “I am familiar with the Siemens control on the DMG Mori CLX 450 and had absolute confidence in the system. Programming the Y axis and driven tools can be done easily, while the verification and graphics check ensure a reliable milling and turning toolpath. EBC brakes has been manufacturing high-performance braking components at its Northampton headquarters for nearly 40 years. In addition to the brakes used in various racing classes, the company produces a comprehensive range for road cars, motorbikes and bicycles, both as a standard series built to OEM specifications, and oversized brakes to increase performance. 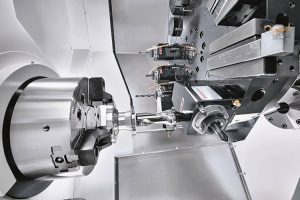 The Haas DS-30 SSY dual-spindle lathe is used to machine the hubs of two-piece discs for the car side of the business, allowing turning of both sides and the drilling of mounting holes. The two-piece disc, a steel rotor with an aluminium hub, is used predominantly to save weight and improve brake disc performance at the extreme temperatures seen on the track or during fast road driving. To solve the issue of the rotor fluctuating in size as it heats or cools, EBC uses an SD (square drive) system, allowing the rotor to slide against the hub as it expands or contracts and therefore avoid warping. 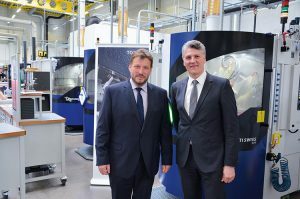 The rise of the Berger Company has seen it become one of the world’s largest enterprises in the field of high-precision turning for the automotive industry, a business built with Tornos turning centres. Berger is constantly investing in state-of-the-art technology to produce turned parts with maximum quality at reasonable cost. Against this backdrop, only a few months after its market launch, the 200th MultiSwiss was delivered to the Berger plant in Ummendorf, Germany. 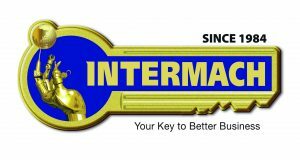 Berger recently pitched to a leading auto OEM for the global supply of a key component on an advanced direct fuel injection system. The volume amounted to 16 million parts. Herbert Maurer, director of corporate sales, recalls that the requirements were, and still are, fierce. For instance, as the part is installed directly in the combustion chamber, it is made of high-strength material, while the complex geometries have to be machined to a tolerance not exceeding 2 µm. In the run-up, Berger considered Tornos and other competitive machines to find the appropriate manufacturing strategy. However, the new MultiSwiss soon turned out to be the best option. “At the moment, it is simply the most precise lathe and, it seemed to be the most appropriate machine to achieve stable processes,” says Maurer. 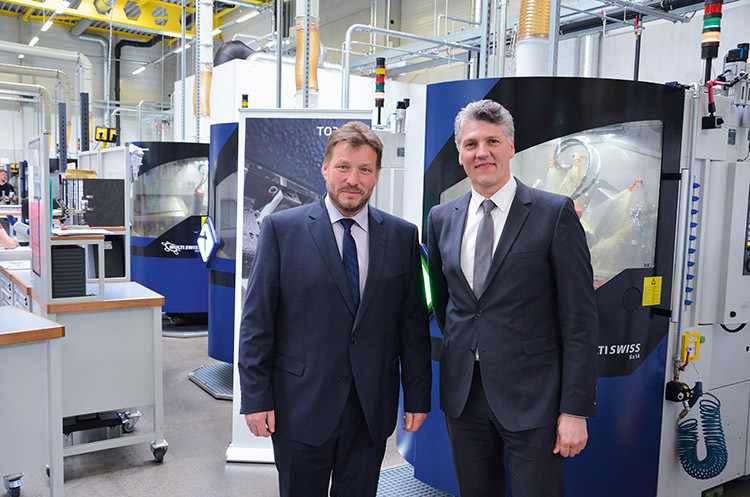 Instead of experimenting on a sole machine, Berger purchased 10 MultiSwiss machines and has optimised the processes from the very beginning with series production in mind. All 10 machines are now running 24/7. Looking at the cuboid aluminium components produced for medical diagnostic equipment by subcontractor AES Precision Engineering, one would think they were milled, drilled and tapped on a machining centre rather than a lathe; indeed they used to be, from sawn billet in two separate operations on a pair of three-axis vertical-spindle machines in a total cycle time of 12 minutes. 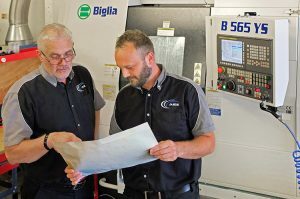 However, since April this year, they have been machined complete from round bar in one operation on an Italian-built Biglia B565-YS 6-axis turn-mill centre supplied by UK agent Whitehouse Machine Tools. Program run time has more than halved to 5.5 minutes, accuracy is improved and there is no handling between machines or work-in-progress on the shop floor, significantly reducing the cost of production. Only two turning tools can be found in the machine’s 12-station turret, one for facing the bar end and another for parting-off, the remainder are axially and radially driven tools. Production engineer Trevor Orman adds: “The quality of the Italian lathe is high for this class of machine, costing under £200,000 with tooling. 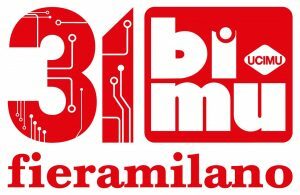 Although tolerances on the medical part are fairly open at 0.1 mm, the Biglia repeats to within microns, which means we no longer have to chase tolerance all day as the temperature varies on the shop floor. 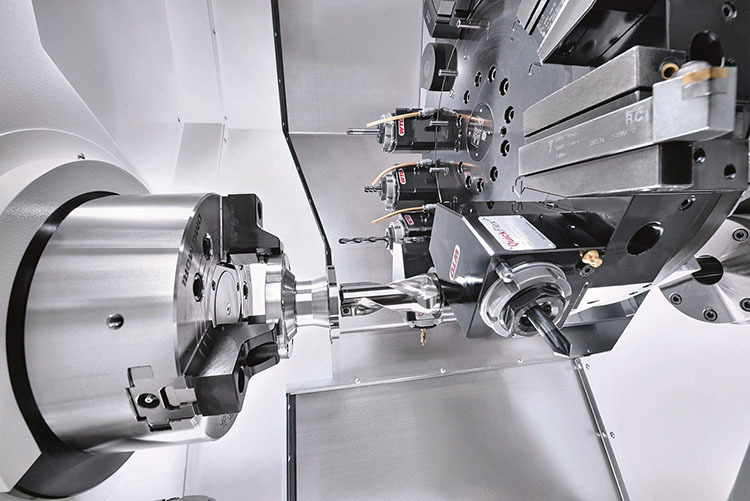 “The machine’s accuracy will also be invaluable for the production of more tightly toleranced components, while its rigidity means that tool wear is noticeably lower than on our other lathes,” he concludes.